Winter has ended here in Arizona, and it feels like we skipped right over Spring. Today we hit 90 degrees and I am afraid there is no going back! So, as my farewell to Winter and Spring, I thought I would share a soup recipe. This recipe comes to me from my good friend, Jen. She has talked about this soup and how I must try it and how her whole family loves it. I tried it and I loved it! First of all, I love wild rice. I also love mushrooms. Plus, this soup is packed with lots of other veggies that make it healthy and a meal in itself. Look at these colors! So thank you, Jen. It is just as wonderful as you said, and my kids loved it! Prepare rice as directed on box and set aside. 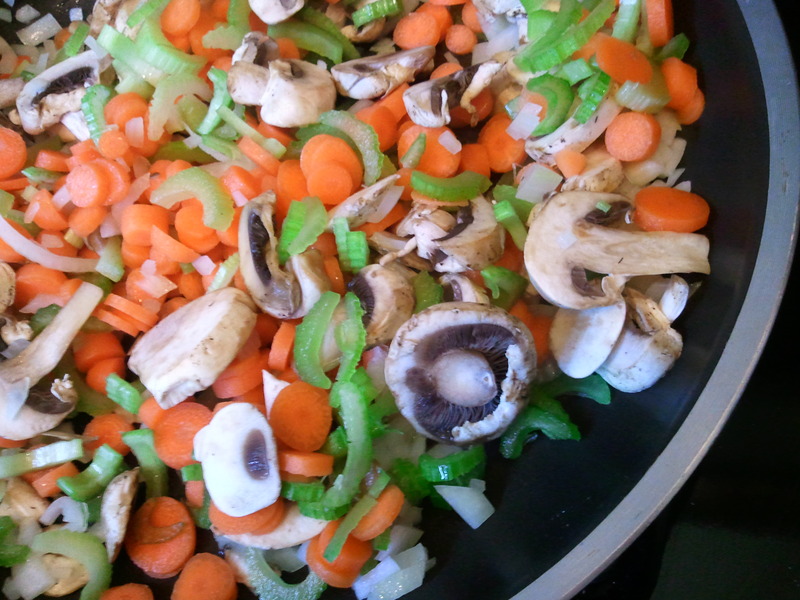 Saute the onion, celery, carrots, garlic and mushrooms in olive oil for 6 minutes. Add the flour and thyme. Stir to coat. Cook one minute. Then add water, chicken broth, and milk. Bring to a boil. Reduce heat and simmer for 20 minutes. Stir in rice and chicken. It is suddenly feeling a little more chilly here in Arizona. It makes me crave soup! I am in love with Mexican food. I love all the spices and cheeses and fried goodness. (remember, we never claimed to be a healthy cooking blog!) 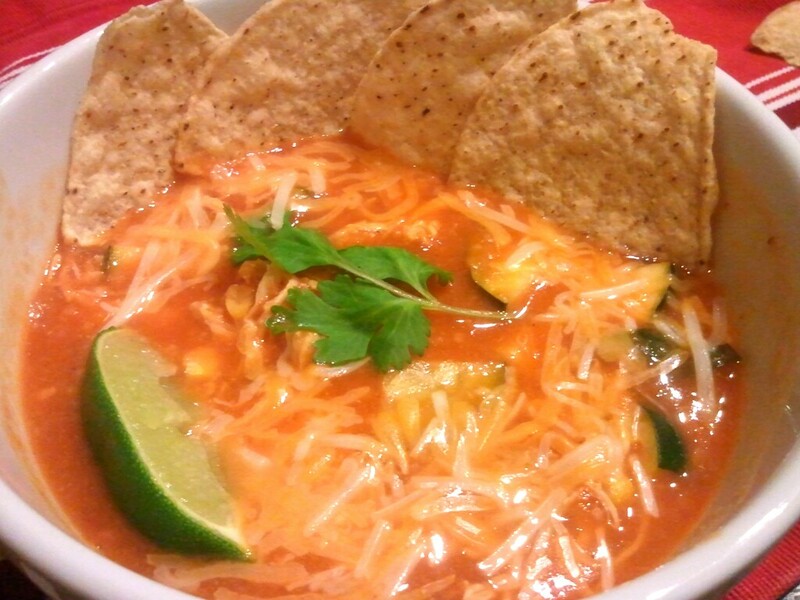 So this delicious Tortilla Soup was no exception of my love for all Mexican food. My good friend and neighbor, Stephanie, brought this over to us for dinner when I was on bedrest with Miss Lucy Jane. She brought us a huge pot of it so I had it for dinner and lunch for several days! I quickly asked her for the recipe and she wouldn’t give it up. I understood, but made her promise that whenever she made some to bring me a bowl. Well, several years later, she is sharing the recipe with us on LJB!! YAY! Thanks Stephanie! You are the coolest! In a skillet, cook the chicken in 1 Tbls. of olive oil on med high heat, about 5 min. per side or until done. Cut or shred chicken into fairly small pieces. In a large pot, over medium-high heat, fry tortilla squares in 2 Tbls. olive oil, until they begin to crisp and turn a golden yellow. Add garlic, onions, jalapeno and cook 1-2 minutes or until onion becomes translucent. Add all ingredients (except corn, chicken, zucchini, water); bring the soup to a low even boil. Boil for 5 minutes. Remove soup from heat. Use a hand held propeller blade to process in batches to the consistency of a course puree. You can also process in batches in a blender. Return the soup to the burner and add the corn, zucchini, chicken and water. Bring the soup to a boil then back off heat until the zucchini is less firm. Be extremely careful to avoid burning or scorching the soup. Serve, garnished with blue tortilla chips, cilantro, Mexican four-cheese, and avocados and even sour cream. This recipe was introduced to me by my sister-in-law, Tia. She served this soup along with three others after her second son’s baby blessing. This was the soup I kept coming back to. It is a thicker soup with a kick of enchilada spice! I love the chunkiness of it. I love that you can leave it in the crockpot all day. I also think this would be a fabulous soup to make with all that leftover turkey we are going to have! 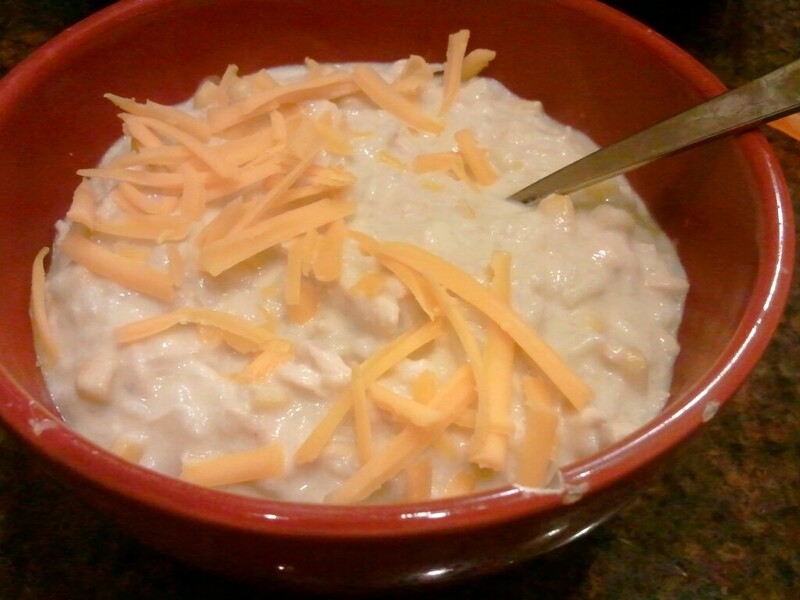 In a medium saucepan mix together cream cheese and 2 cups of chicken broth. Stir with whisk over medium heat until cream cheese is melted and blended. 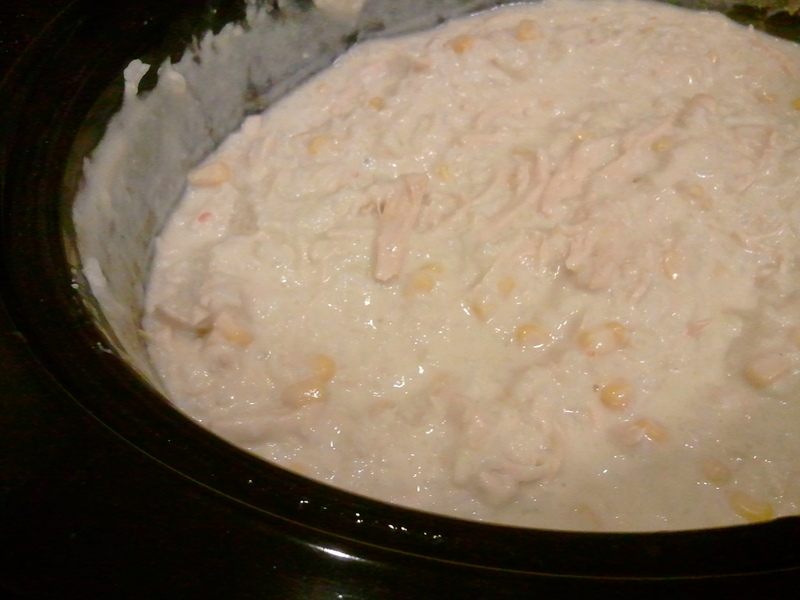 Poor enchilada sauce, half and half, corn and chicken in crockpot. Add the soup/cream cheese mixture. Cook on low for 2-3 hours. Add additional 2 cups chicken broth to reach desired consistency. (this is a thick soup!) Add the rice approximately 30 min – 1 hour before serving. I let my soup stay in the crockpot, on warm, while we were out running errands one day. I served with warm rolls and it was the perfect winter time meal! Enjoy! Today we are having our very first guest blogger here at Lucy Jane’s Best!! And what better way to show you where lots and lots of our inspiration comes from than to have our own Mom be a guest and share a great recipe with you all! She is one the greatest cooks and bakers that we know. And we were lucky enough to inherit many of her recipes and tricks in the kitchen. Yes, we know, she looks like she could be our sister! She is beautiful, talented and smart! She goes by Victoria these days. We grew up in a home where we would have dinner together as often as possible. With 4 kids it wasn’t possible every night, but it was pretty darn close. Our mom made lots of great meals, but what we remember most was that she wasn’t afraid to try new recipes. And by trying new recipes she learned the art of cooking and baking. In late fall, the air feels crisp and clean, the sky is a brilliant blue, and evening brings a chill that signals winter. Fall is soup weather and a good creamy tomato basil bisque is the perfect choice for those evenings when you crave comfort food. This recipe is one of my favorites and it goes great with a crisp green salad or a yummy grilled cheese sandwich. Add a little Havarti and some Gruyere to the Cheddar cheese you’re used to using—put it on a good crusty bread and you’ve given a little flair to your grilled cheese sandwich, plus you’ll have a great meal for dinner or lunch. My daughters, Shannon and Emily have asked me to do a guest spot on their blog and they specifically requested this soup. It is yummy and so easy to make. A little about me? Besides the fact that my husband Bob and I have two amazing daughters, we also have two great sons and eleven brilliant grandchildren. I’m a lawyer turned writer and I love to cook when we’re having any or all of these relatives over. 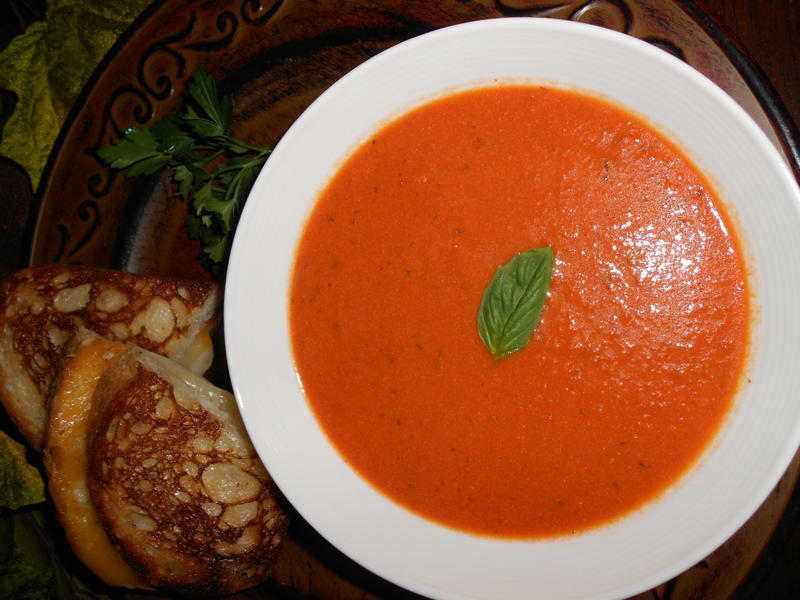 If you love tomato basil soup, this one will become a favorite. Chop the onion in a food processor or blender and sauté in the butter. Add tomatoes and cook briefly, breaking up with spoon. Remove from heat. Add tomato paste and seasonings. Dust with the flour and cool a few minutes more. Mixture should be thick. Purée in food processor or blender. Return to heat and add chicken broth and then cream or milk. Taste to correct seasonings. Can you believe that it is October already? That means somewhere in the U.S. the leaves are starting to change colors, the evening air is now chilly, and snow is not too far off in the forecast. I wish I could say all those things were happening where I am, but it is still a whoppin’ 95 degrees here. So, I chose to “create” a little fall. I made this fabulous Taco Soup this weekend to start off our October. And in a strange coincidence, Shannon did the same! 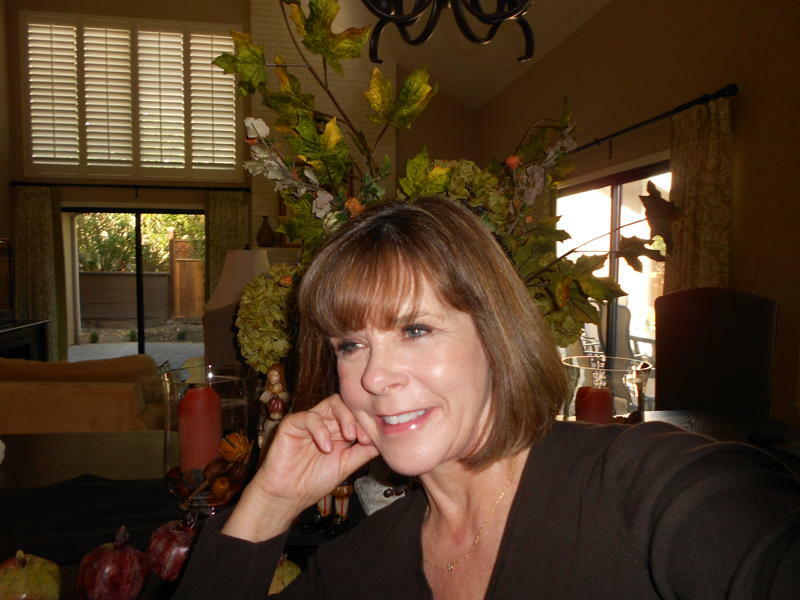 We are sisters and co-authors of this blog, but we are also soul mates, best friends. We are in tune. We love eachother to the moon and back. I guess what I am saying is, it didn’t surprise me that we both made this soup on the very same day without knowing the other was making it! I make this Taco Soup every Halloween. We eat this to fill our bellies so we can ring an insane amount of doorbells. (my kids love candy!) 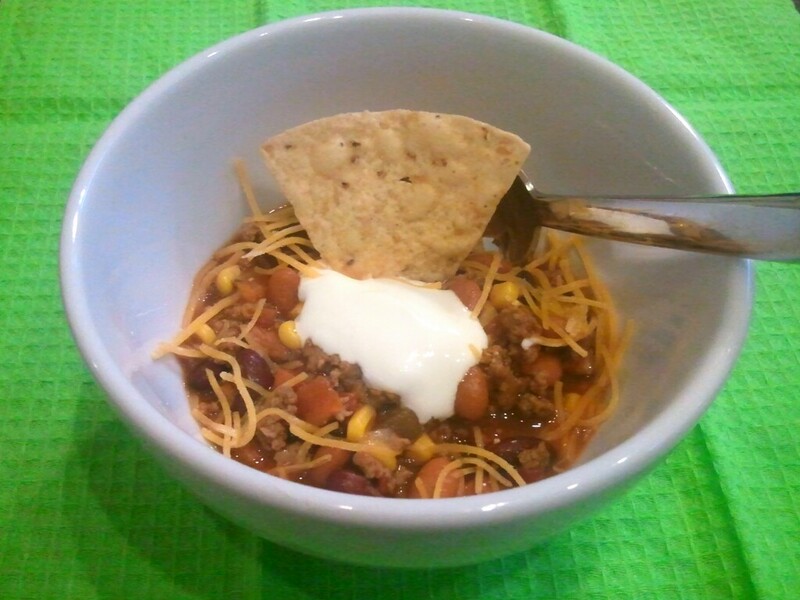 I know we all have a Taco Soup recipe, but this is THEE ONE! The secret ingredient is the Ranch Dressing packet. It just kicks it up! And with this soup being so easy to make, maybe you should try it on Halloween night, too. It’s a great tradition! Brown the ground beef and onions in a large skillet. Drain the excess fat and discard. Transfer beef and onions to a large stock pot or a crockpot. Add the beans, corn, tomatoes (all), green chiles, taco seasoning, and ranch dressing packet. For stockpot, bring to a boil, then turn heat to low and let simmer for one hour. 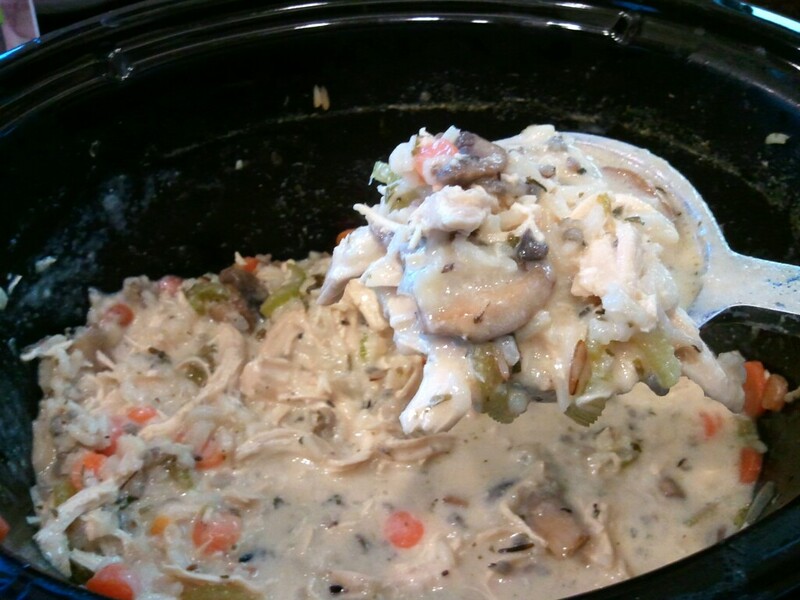 For crockpot, cook on low for 4-6 hours. When serving, garnish with chips and top with sour cream, cheese, olives, green onions, jalapenos….whatever your heart desires! !